This website provides a comprehensive overview of the information submitted by the 27 Member States of the European Union (EU) and five candidate countries in their 2010 annual reports to the Convention on International Trade in Endangered Species of Wild Fauna and Flora (CITES). It describes their trade in species listed in the Appendices to CITES and the Annexes of the Wildlife Trade Regulations, which enforce CITES in the EU. 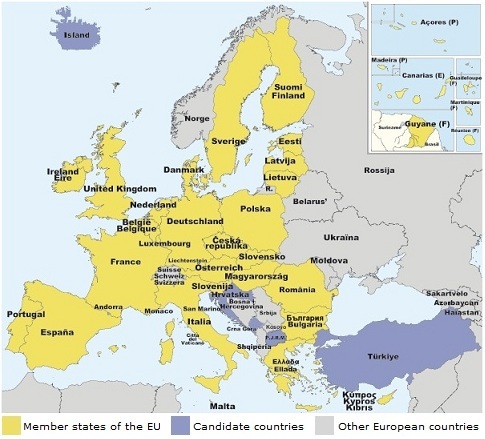 EU Member States and candidate countries in 2010 © European Commission. During 2010, the relevant Wildlife Trade Regulations were Council Regulation (EC) No 338/97, (EC) No 407/2009 and (EC) No 709/2010, and Implementing Regulation (EC) No 865/2006 amended by (EC) No 100/2008. Data on trade between EU Member States, trade in artificially propagated Appendix-II plants, and re-exports of manufactured articles were excluded from the analysis. Trade recorded as a seizure/confiscation (source ‘I’) was also excluded, as reporting is inconsistent and incomplete within the CITES Trade Database. Where appropriate, conversion factors were applied to terms and units to facilitate analysis. Throughout the text, certain country names have been abbreviated; a key to these abbreviations is provided in the Glossary. The 2010 data used for the analysis were taken from the CITES Trade Database on the 24th of April 2012, following the submission of CITES annual reports by Member States and their key trading partners. This analysis only includes data from three of the five candidate countries: Croatia, Montenegro and Turkey. Annual reports had not yet been received from FYR Macedonia or Iceland at the time of analysis. Click here to view details of the 76 non-EU CITES Parties and dependent territories (including the candidate countries) that had submitted their annual reports for 2010 at the time of the analysis.